Born in the UK, Andy studied dentistry and worked as a general dentist in London before moving abroad to head up the Brunei Shell Company Dental Clinic. Returning to the UK in 1994, he completed a postgraduate degree in Children’s Dentistry at the Eastman, then migrated to Adelaide in 1996, where he took his specialist training in Orthodontics. Andy moved to Perth Dental Hospital in 1999, and started private practice in the South West in 2000, with branches in Mandurah, Busselton and Bunbury. The practice won the Telstra WA Small Business Award in 2004, and went on to achieve full Accreditation in 2013. Having consolidated to a single location, Andy now operates from Bunbury only, which allows him to provide a better service to the community. Andy loves straightening teeth, loves seeing the effect of treatment on self-esteem and confidence, and is focused on facial balance. 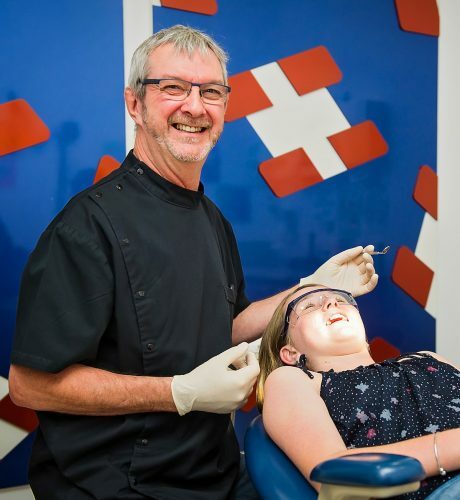 He is actively embracing (haha) digital orthodontics, is committed to clinical excellence, and has gained a reputation for his friendliness – particularly with small people, and his attitude to customer service, care and approachability. Andy plays bass & sax in a band, is a keen bridge player, and is also a DEC registered volunteer snake catcher.